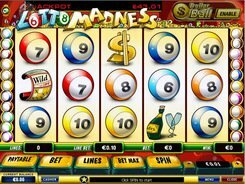 Five-reel 20-payline Lotto Madness video slot features the symbols of dollar bills, champagne, a lottery player and lotto balls in various colors and values. Place up to 10 coins per line and adjust the coin size from $0.01 to $1. The maximal bet you can place is $200. The highest payout of 10,000 coins is granted for a combination of five wild symbols on an active payline. In addition, the wild icon has the power to substitute other symbols, except scatters. The Dollar Bills symbol stands for the scatter that can appear anywhere on the reels and multiply your total bet by as much as x50. The Crazy Wheel is the bonus symbol that starts the bonus round landing on reels 1 and 5. Spin the Wheel of Fortune and wait till it comes to a stop. Depending on the symbol that has reached the arrow marker, you get free spins or bet multipliers. PLAY FOR REAL MONEY!